It’s amazing how time flies. After a fantastic summer of beer festivals, tastings, and some truly tasty brews, we’ve made it back to the most wonderful time of the year- Great American Beer Festival! 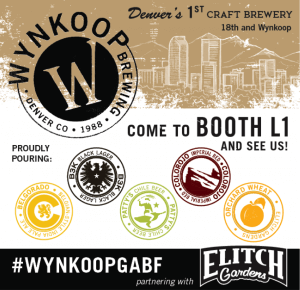 We here at the Wynkoop have been hard at work preparing some tasty treats and fun events around the festival, coordinating with some of the greatest folks in the industry. Seeing as it’s harvest season, we brought back one of our all-time greats, the Fresh Hop Belgorado. Using 250 lbs. of fresh Chinook hops from our friends at Misty Mountain Hop Farms along with its all-Colorado malt blend thanks to Colorado Malting company, this incredible beer is only available for a few days (until we drink it all!) Its first public appearance will be at the Fresh Hop Festival tomorrow at Falling Rock Tap House from 12-4pm. It’ll be popping around in different areas as well- be ready for some HOPS! For those with a sweeter palate, we went a little crazy. With our friends over at Elitch Gardens, we took our Western Slope Cider and kicked it up a notch (or 10) by adding sea salt and fresh caramel. You’ve probably never had a Salted Caramel Apple Cider before, but it is genuinely delicious and a truly refreshing fall beer. It’s available at Elitch Gardens this weekend and will be surprising folks with random tappings throughout the week! Be sure to check our website’s events calendar and stay updated on the happenings through the best week of the year and we look forward to seeing you all at the Great American Beer Festival!